Visiting Albuquerque in an RV? 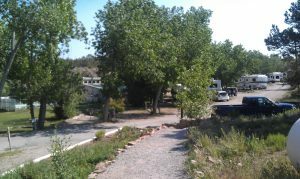 Hidden Valley RV Resort in Tijeras, New Mexico YOUR “home base” for your stay. Hidden Valley RV Resort is located literally two minutes off I-40 (exit 178), on the side of a hill, and despite its convenient proximity to the Interstate (and the Mother Road Rt. 66), the park’s setting is secluded and quiet. I stayed here for a time both before and after repairs to my 5th wheel by Rocky Mountain RV in Albuquerque. Incidentally, I highly recommend their repair department – highly professional, and attentive to detail! The Turquoise Trail (Rt 14) is just minutes west of Hidden Valley – this is the OLD Rt. 66 stretch (pre-1937) to Santa Fe. Don’t worry, the road has been improved since then! Just minutes up Rt 14, you’ll find “Coffee At Dawn” – a “homey” coffee shop with a friendly crew offering at least 5 different brews each morning! Cedar Crest, the first town you encounter along the Turquoise Trail also has several quality eating establishments – offering everything from healthy salads to ribs and tap beers. Need a market? There is one of some size there too! Farther up the trail, you’ll encounter the road up to Sandia Peak. 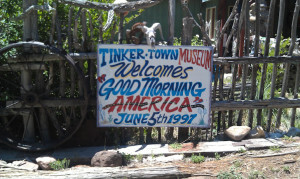 Your first “attraction” along the mountain road is Tinkertown. (Click the link to see what Tinkertown is.) Continuing up the access road, you will pass numerous hiking trails before reaching Sandia Peak Ski Area, a ski area in the winter, a mountain biking center in the summer – with a great cafe and high altitude views, and even a tram to ride to the top of the 10,300 ft. mountain peak! Returning to Hidden Valley, the resort itself has all the amenities you would expect. 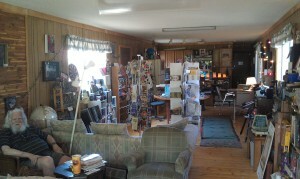 You can see details here on Hidden Valley RV Resort’s new Facebook page. Hidden Valley RV Resort <—- Click Here! When you visit Hidden Valley RV Resort’s website, “like” their page and then email them, they will return the favor with a special rate for your first nights stay! Just remind them when you are making your reservation. Final thoughts – and one more way to save… Hidden Valley RV Resort accepts Passport America – locate and click the banner on the right side of this page to get a Passport membership and save on your stay at Hidden Valley and at hundreds of parks across the continent! Hidden Valley RV Resort is a unique RV park, offering everything you would expect onsite (pool, hot tub, pull-thru sites, wifi, 50A power, modern rest-rooms) at most modern RV parks, but with the added ambiance of its location and the nearby attractions. Yes, there is a place called TINKERTOWN! But, no it is not a town. Tinkertown is the result of a man’s life work. And it is an experience to visit and see it. The best part of being a traveler is the people I meet and the places I find. Yes, the places I find – while I do plan my route and the RV park I’m going to stay at, I rarely study an area in advance to see “what to do and where to visit”. Why? I am often pleasantly surprised at what I find! Ross Ward, a very creative individual created this over the course of his years. Now departed, taken early by early onset Alzheimers, Ward’s wife continues to operate this “museum” – this year is its 29th year of continuous operation! Truly a “build it and they will come” story, you have to see what Ross Ward created…and THAT is why I made this video. 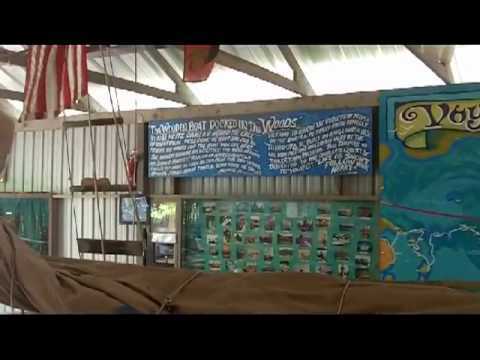 I take you on a walk-through of his exhibits. I know the video is 32 minutes, and if time is a factor, watch the first 4 or 5 minutes then jump to 18:25 – trust me, it will be worth it. As you watch the segment that begins at 18:25, do yourself a favor… allow yourself to DREAM – and consider what *might* be! After you see it, you’ll see why this particular segment resonated with me! Tinkertown is also a testimonial to entrepreneurship and to thinking outside of the box. THAT has been a big factor in the choices I’ve made in recent years. I am now entering my 7th year without a “J.O.B.” So, when I see someone who is forging their own way – I’m impressed. Plus, I’m fascinated by memorabilia – and in the video you’ll see lots of “old stuff” – both real (tools and more) and depictions that date from a century or more ago! Anyway – this is one of those “hey Al, what do you do when you’re on the road posts”… I’ve got more to share that is business related but it can wait till a bit later. America is a truly amazing nation. Blessed and Exceptional in MANY ways. I believe it is special, and yes, it goes even deeper than that. Today, we again are a nation at war (and have been for much of the nearly 70 years since WWII ended). But, these more recent wars are different – while we have men and women, brave men and women, patriotic men and women fighting for a continuation of the American ideal, we here at home easily forget that these conflicts are ongoing as virtually no sacrifice is asked of us. Today is a day designed to pause and reflect – ever since the Civil War. 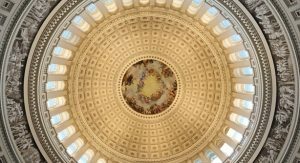 Yes, some may debate over the nature or even the validity of the wars we have fought in recent decades, but only a fool would deny that evil still exists and from its founding, America has been different – and yes, special – and I for one certainly believe our ideals are worth defending against that evil. I said America is different…and from the get go here is evidence – Did you know that when George Washington surprised the British forces (actually Hessian forces) in Trenton – in December 1775, a battle that turned the tide of the Revolutionary War, the men he attacked and captured – and then imprisoned, were offered shortly afterwards by the Continental Congress in a declaration signed by John Hancock full amnesty if they agreed to drop their agression against “the rebels” (Washington’s troops), and join the effort to build a new nation that valued freedom? Have you ever heard of such an act? Few, if any, conquering armies were so quick to free their enemy and embrace them as friends. Interestingly, Rob Lowe’s (the actor) 5th great grandfather was one such fellow – who actually later helped in the Revolutionary War effort for OUR side! That made Rob eligible for membership in the “Sons of the American Revolution”! Fast forward nearly 200 years, after the evil that caused WWII was defeated and the Germans and Japanese were beaten into submission (a great way to end a war in my opinion), we turned around and provided billions in the effort to rebuild these nations. Today, Germany and Japan are close allies and trading partners with our nation. Yes, things have become muddied in the past few decades, but that does not mean we don’t live in a truly blessed nation, or one with the best Constitution ever created by man. So we take at least part of this day and pause – reflect – and consider those who gave the ultimate sacrefice, whether it is a young man who lived down the street and went off to Iraq or Afghanistan or a distant relative who fought in WWII, WW1 or an earlier war. I am certainly NOT going to promote or market anything today – but – I will share based upon a recent interview, I am adding a new book to my must read list for this summer. 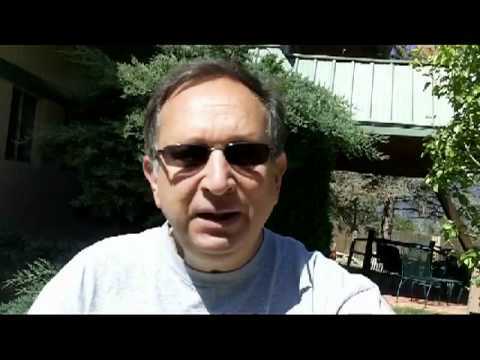 Here is a link to a video that shares a connection between our nation and Ancient Israel. In closing, tomorrow I have some very interesting and important information to share that IS business related…but, it can wait until tomorrow. For now, go eat a hot dog, drink a beer, throw a frisbee, AND pause to reflect. Are you following gold and silver? Have you noticed they recently appear to be under attack? If you’re like me, perhaps you’ve been keeping an eye on silver and perhaps even buying some as other investments – even keeping money in the bank, just don’t look very attractive right now. That is why I follow silver and gold. You may have noticed that since silver hit nearly 50./oz. and gold nearly 2000./oz. – they have fallen back…or is it more appropriate to say beaten down?? The good news when you read Will Bancroft’s article is that each of the experts he cites makes statements that you and I can access at no charge. Should You Go All-In on Silver or Gold? investing his entire portfolio in precious metals. part of your current investment strategy). us all a great update. that process will only continue to accelerate. never before seen in human history. deleveraging is allowed to take place. printing trillions upon trillions of more dollars. inevitable outcomes that lay ahead. selling… I’ll be backing up the dump truck. the following actions we should take. convince family members to take action”. 90% of my investable cash in precious metals. 1. I’m a risk-taker by nature. 2. I didn’t know any better. well during deflation or hyperinflation. different assets with new funds. emotion, instead of strategy and experience. safe and profitable no matter what happens. EVG Research team here again. gold and silver prices lately. Register for the EVG Webinar Here. wealth-building strategies of the rich.